Chalet Suites, offers self-contained jacuzzi and fireplace suites with private entrances and upscale amenities to include AppleTV with free NetFlix, ESPN, the fastest free high-speed WiFi in a three county area and a full breakfast in your suite included in the nightly rate - not an extra surcharge. Constructed in traditional Alpine style, and designed for those seeking privacy and the quiet beauty of the mountains, our mini discreet hotel provides amenities rivaling those usually found only in big city hotels, along with beautiful vistas, hiking trails at your doorstep and freedom from the drone of traffic. 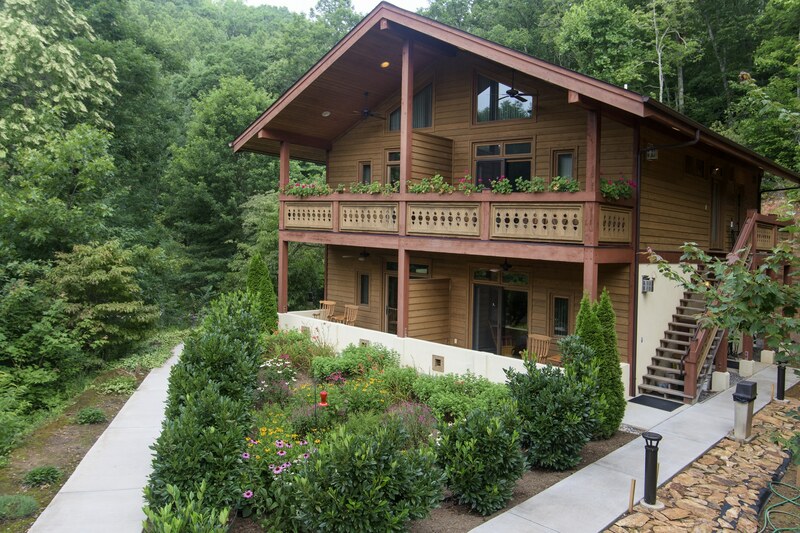 Nestled in a 22 acre private forest where the Smoky Mountains meet the Blue Ridge Mountains between Cherokee, Bryson City, Dillsboro and Sylva, North Carolina, we are easily accessible and just minutes from Western Carolina University. Priced from $150 to $238 per night. Enjoy an unique hotel that emphasizes privacy and the solitude of a smoky mountain chalet that includes housekeeping and breakfast. Just minutes from Western North Carolina's most popular sights and attractions. Spacious Private Patio or Balcony with rockers. Fresh flowers in your suite. Imported chocolates in your suite. Picnic areas with grill & tables. Regulation croquet, bocci ball, horseshoe and badminton courts.